We’d love your help. Let us know what’s wrong with this preview of A Voice That Could Stir an Army by Maegan Parker Brooks. The first scholarly analysis of the inspirational activist's profound speeches. A sharecropper, a warrior, and a truth-telling prophet, Fannie Lou Hamer (1917-1977) stands as a powerful symbol not only of the 1960s black freedom movement, but also of the enduring human struggle against oppression. "A Voice That Could Stir an Army" is a rhetorical biography that tells the st The first scholarly analysis of the inspirational activist's profound speeches. A sharecropper, a warrior, and a truth-telling prophet, Fannie Lou Hamer (1917-1977) stands as a powerful symbol not only of the 1960s black freedom movement, but also of the enduring human struggle against oppression. 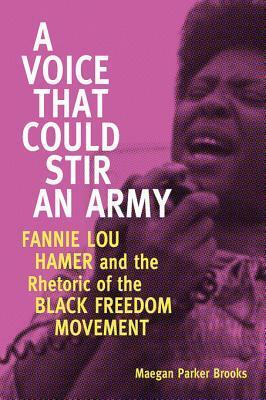 "A Voice That Could Stir an Army" is a rhetorical biography that tells the story of Hamer's life by focusing on how she employed symbols-- images, words, and even material objects such as the ballot, food, and clothing--to construct persuasive public personae, to influence audiences, and to effect social change. To ask other readers questions about A Voice That Could Stir an Army, please sign up. A Voice That Could Stir an Army is informative, well written/researched and all that that "well" stuff implies. But to analyze every word/sentence Mrs. Hamer ever spoke gives an extraordinary life lived a cardboardish feel.